Mexico has passed rapidly through a “nutrition transition”. Ingredients for guacamole. Photo: Chef Daniel Wheeler. All rights reserved. 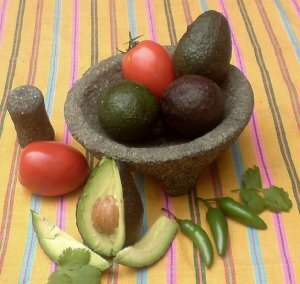 The traditional Mexican diet was based on corn and beans, supplemented by fruits and vegetables with relatively little meat and dairy products. Over a 15-year period the average Mexican ate 29% less fruits and vegetables and 6% more carbohydrates while consuming 37% more soft drinks. In fact Mexicans now enjoy the dubious distinction of being the world’s greatest consumers of soft drinks, downing 160 liters a year on average. White bread is replacing tortillas, fast food is replacing home cooking. This nutrition transition, together with a more sedentary lifestyle, fueled a “disease transition”, characterized by a shift from high mortality due to infectious diseases to high mortality from non-communicable chronic diseases. To see how Mexico compares with other countries—USA, Spain, France, Japan, Russia, Brazil, South Africa, China and India— in terms of eating habits, see this recent graphical comparison: New York Times Business section article of April 3, 2010, entitled “Factory Food” Mexico’s per person consumption of vegetables is lower than any other country on the chart except South Africa. Mexico’s consumption of “processed, frozen, dried and chilled food, and read-to-eat meals” is lower than any country except China and India, but Mexicans make up for this with a consumption of “bakery goods” that is more than double that of any other country on the chart. This post includes edited excerpts from chapter 28 of of Geo-Mexico: the geography and dynamics of modern Mexico. Buy your copy today!